The California Democrat's presidential campaign said the proposal would be paid for with unspecified changes to the estate tax. WASHINGTON — In the first major policy rollout of her presidential campaign, Sen. Kamala Harris, D-Calif., on Tuesday unveiled a plan to spend hundreds of billions of dollars to boost teacher salaries. "We must acknowledge this simple truth: We are a country that claims to care about education, but not so much about the education of other people's children," Harris said in a Washington Post op-ed outlining her proposal. Under the California senator's plan, the federal government would finance 10 percent of the total pay increase for the first year and then pay out $3 to states for every dollar they put into additional salaries. It would commit additional funds to further increase salaries for teachers in highest-need schools along with a "multibillion-dollar investment" in career development for educators. Half of it would go toward teachers studying at historic black colleges and universities and other institutions with predominantly minority students. The campaign bills these measures as a way to train, attract and retain teachers in poorer communities where schools have grown more racially segregated in recent decades. The Harris proposal comes amid an extended period of tumultuous fights over education funding, including strikes in places like West Virginia and more recently Los Angeles and Oakland. The protests, walkouts and strikes played a role in the midterm elections as teachers ran for office and Democratic candidates argued that tax cuts in some Republican-led states had left schools underfunded. "You see the same issues about low teacher pay in urban Los Angeles and in rural West Virginia, when you see that school districts are strapped all across the country and as a result have made choices to not create a living wage in the aftermath of the last recession," Randi Weingarten, president of the American Federation of Teachers, told NBC News. "What Harris is trying to do is say, 'How do we jump-start this?'" Funding for K-12 education is primarily dictated by state and local governments. The Harris proposal appears to signal that national candidates are looking for ways to capture the activist energy among teachers — a valuable constituency in a Democratic primary — by expanding the federal government's role. 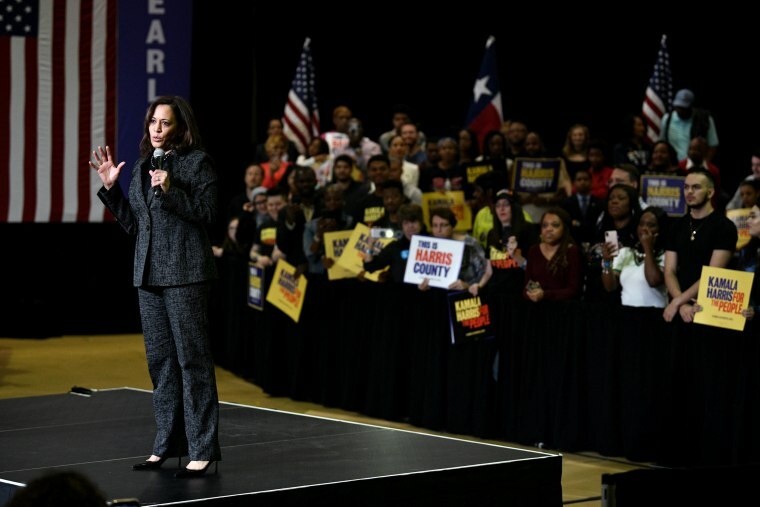 "We've had a decade of disinvestment in public education," Catherine Brown, a senior fellow at the Center for American Progress Action who consulted with Harris on the plan, told NBC News. "It's a national problem that demands different kinds of thinking and a national solution, and I think she's responding to that." Critics argued the plan is too expansive — and expensive — a foray into education for the federal government, with some arguing school systems should look to teacher pensions for savings rather than adding new spending elsewhere. "I think what she's proposing will cost a lot of money we don't have, but in the context of a Democratic primary it's smart," Liz Mair, a Republican strategist who's worked on education issues in the past, said. "I haven't seen anything like it."